Since you opened a bottle of wine all that oxygen left inside the bottle caused your delicious wine to oxidize and become dull. By using this wine saver vacuum pump, you can remove all the air from the bottle, keeping the wine fresh. 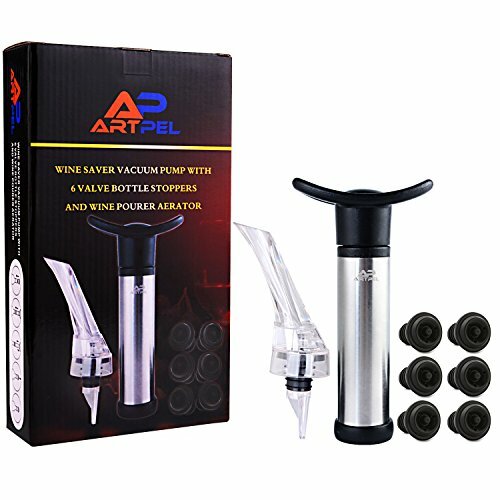 ArtPel Vacuum Wine Pump Preserver Kit is the best choice. The Wine Sealer Pump lets you Enjoy your Wine Today, Tomorrow & Days After. Save your Wine for Next Time! If you don't drink the entire bottle, preserve wine & seal the bottle. Simple to use with washable stoppers that can be inserted easily. Not suitable for sparkling wine. The Wine Pump it is a hand operated pump that keeps wine with natural fresh smell and original taste up to 14-15 days after opening. Store your bottles aside & forget about messy leaks. Cap the bottle with a stopper, place the pump on the top of stopper and pump an air out until you feel the resistance, it's done! Also, you can buy extra 6 reusable Wine Stoppers for this Wine Vacuum Pump. Wine Saver Pump Weight: 88 g / 3.10 oz. Also, you get from ArtPel a Wine Decanter created with large air chamber to infuse maximum amount of air using the Bernoulli Effect . If you want to keep your wine FRESH, go head and click the buy button "Add to Cart"! ArtPel Wine Air Pump is a hand operating pump. First, cap an opened bottle with one of the stoppers; Second, place the pump over the stopper; Third, pump the air out until you feel the resistance, it's done! In the package you should receive "Thank You Card" with operating instructions and Wine Saver Vacuum Pump with 6 reusable wine stoppers and Wine Decanter. ArtPel provides 24-month warranty and great customer service. If you want to keep your wine FRESH, go head and click the buy button "Add to Cart"! If you have any questions about this product by ArtPel, contact us by completing and submitting the form below. If you are looking for a specif part number, please include it with your message.